In todays newspaper "The Telegraph" (online) - BODIE 3.7 . you'll never walk alone ! This is the online version, i bought a copy of todays newspaper (not that i read "The Telegraph" but today i will make an exception)..oh my , a full spread on The Professionals. BEAUTIFUL!!!!!! 40 years ago, what a long time. Nice to see something about the lads in the here and now. Although the cars in the first season weren´t nice. The Capri became very popular because of this gorgeous show. yes where has 40 years gone, it's flown by so quickly. I still remember The Professionals being aired in the uk for the first time and me being hooked ever since. Srsly, 40 years today? Amazing! Yes it is a lovely tribute to the lads and 40 years, where has that time gone , it's literally flown by and i'm still as hooked on it now as i was all those years ago. The 'late, great Lewis Collins' - I think I like this journalist! You can register with the Telegraph for free and read it. Thanks for pointing it out. Ahh yes "the late, great Lewis Collins" what more can you say about him. What a legend and my favourite actor EVER . I rushed out yesterday to buy a copy of the newspaper which turned out to be a different image from the one online and a full page spread of the lads. Forty years ago tonight. Blimey! Thank you for posting the scan! 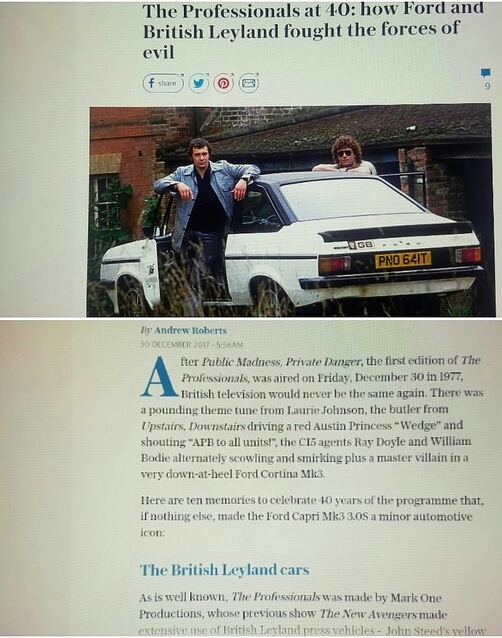 Forty years, where has the years gone and i still remember The Professionals being aired in the uk for the first time (though i was only eight years old at the time) and i'm still hooked on the series even now. The newspaper article is different to the online version and i managed to buy myself a copy yesterday. Loved the comments - I had a good laugh at the whiney man-children. there is a beautiful full page spread of the lads with the interview included. 40 years ago, just where has the time gone but i still love the series just as much now as i did back then. Ooh, wonderful--thank you for letting us know about this! Somehow, the 40th anniversary just snuck up on me. 40 years! Thankyou so much for looking and for your comment. I had to buy a copy of yesterdays newspaper because the article is different from the online version . There is a ful page spread of the lads.40 years, where has time gone and i'm still hooked on the series just like i was way back then. If anybody has the premium so I can read the entire article, that would be fabulous! I think you would need to register just the once to read the online version. you are welcome and i'm glad that you got the chance to read the interview, thankyou for letting me know. I'm so happy that Pros is still worth an article! oh me too but 40 years, where has time gone. I still remember The Professionals being aired in the uk all those years ago and i am still hooked on the series just like i was back then. That was a lot of fun. I LOVE that scene where Bodie gets clapped by the commuters, it always makes me laugh! It pops up on the CI5 twitter feed sometimes and I always retweet it. it's a scene that i never tire of watching and could watch it over and over again. Thankyou so much for looking and you are most welcome. Oh wonderful find! Looking forward to reading this tomorrow, during my mega catch-up. Thanks for sharing! I had to but a copy of the newspaper because the article is a full page spread of the lads. i hope you enjoy reading the interview and thankyou for looking. It's so lovely to see the tributes, glad to see it's not just us remembering it fondly.